Trans-K kids learn to read. Each year, kids in the Trans-K and Kindergarten classes are given intensive instruction in reading. At first, students learn the sounds that letters typically make, so that they become really skilled decoders of text. The academic achievement of Mt. Helix Academy Kindergartners is truly remarkable. To start with, students entering our Kindergarten are not much different from beginning Kindergartners everywhere. Some know a few of the sounds corresponding to letters of the alphabet, and some can name a few of the letters, but only a rare student enters our Kindergarten as a proficient beginning reader. Many entering Kindergarteners can count to 10 and can accurately identify how many items there are in a small group of items. A few can write some of the numerals up to 10, but they demonstrate next to no othermath skills. Some entering students can write their first name legibly, most can spell a word or two, and a few have not yet quite figured out to hold a pencil. By the time they graduate from Kindergarten, however, the basic skills competence of Mt. Helix Academy students has soared. All are readers and many read and comprehend controlled vocabulary stories written for students at the end of second grade. Because our students have participated in daily language and vocabulary development lessons, their vocabulary, reading comprehension, and their communication skills have improved immensely. Academic achievement is equally stunning in mathematics. The graduates of our Kindergarten can add and subtract two digit numbers; solve word problems involving addition and subtraction; identify amounts of money involving pennies, nickels, dimes, and quarters; and use a ruler to measure various objects. We test our Kindergarteners in April and May of each year to see how well they have achieved compared to children across the U.S. We use the recently revised version of the Wechsler Individualized Achievement Test (WIAT), which is administered individually by professional staff members who are trained how to properly administer the test. The chart below shows the results for the Mt. Helix Academy Kindergarten class of 2008-2009. 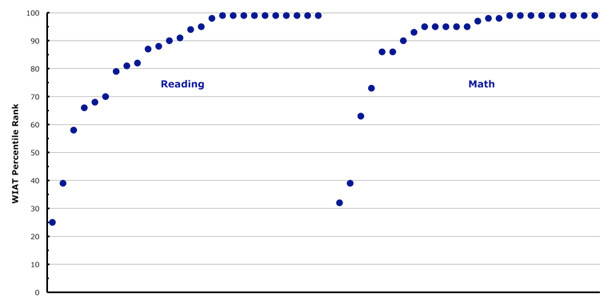 Each of the dots reflects the percentile rank of one of our students on the Reading subtest and then again on the Math subtest. The results are astonishing. On the Reading subtest of the WIAT, 20 of the 26 students (77%) in our Kindergarten class scored in the top quartile. On the Math subtest, 22 of the students (85%) scored in the top quartile. The top quartile for this test, or any standardized test for that matter, includes 25 percent of those taking the test in the standardization group. That means that we should expect that only 25 percent or one-quarter of our students would score in the top quartile, but that’s not what happened in 2009; nor is what happens every year for Mt. Helix Academy Kindergarteners. 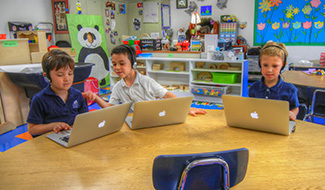 More than three-quarters of our Kindergarten students achieve in the top quartile. Even more incredible is the number of students who scored in the 99th percentile. The 99th percentile is one in a hundred and Mt. Helix Academy’s Kindergarten only had 26 students enrolled. We shouldn’t expect to have any students scoring in the 99th percentile with only 26 students, but that’s not what happened in 2009; nor is it what happens every year for Mt. Helix Academy Kindergarteners. Ten of the 26 students (38%) achieved at the 99th percentile on the Reading subtest and ten students achieved at the 99th percentile on the Math subtest. No school should expect to achieve at this level, but Mt. Helix Academy does it year after year. We do it because we use evidence-based methods and the most research-validated materials. In addition to their reading and math achievements, Mt. Helix Academy Kindergartners take great pride in their ability to write complete sentences with beautiful handwriting. They enthusiastically demonstrate their ability to name all fifty states and their capitals and to speak a bit of Spanish. They have acquired important study and organizational skills, which set them up for success in future grades, and perhaps most importantly of all their achievements, Mt. Helix Academy Kindergarteners have learned to love learning and can’t wait to get to school each day.